$96 million is a lot of money. Hell, it’s astronomical, by the average person or motion-picture studio’s standards. Most of the time, when a movie makes that kind of cash at all, let alone in a single weekend, there’s no question that we’re talking about a runaway smash. But everything is relative in the box-office arena, and “most of the time” doesn’t describe a mega-budget superhero blockbuster with a whole studio’s future riding on its broad, cape-and-cowl-draped shoulders. As we noted last night, Justice League’s $96-million debut is the lowest opening weekend yet for the DCEU, a franchise whose previous four entries—Man Of Steel, Batman V Superman: Dawn Of Justice, Suicide Squad, and this past summer’s Wonder Woman—all landed over the $100-million line in their first weekends. This is bad news for a number of reasons, from the fact that the undisclosed budget of Justice League is rumored to exceed $300 million to what it says about audience demand for these characters, whose appearance together probably should have guaranteed attendance at least on par with what the earlier movies secured. It’s also not much more than what Logan made out the gate earlier this year, despite an R rating, no 3-D screenings, and a noted lack of Batman. Did DC blow the advertising campaign by not better indicating that a certain marquee attraction would indeed be appearing? They didn’t exactly keep it top secret, given the widely available cast list. Are audiences tiring of superheroes? Probably not, given that half of the year’s 10 highest grossing movies feature comic-book creations. 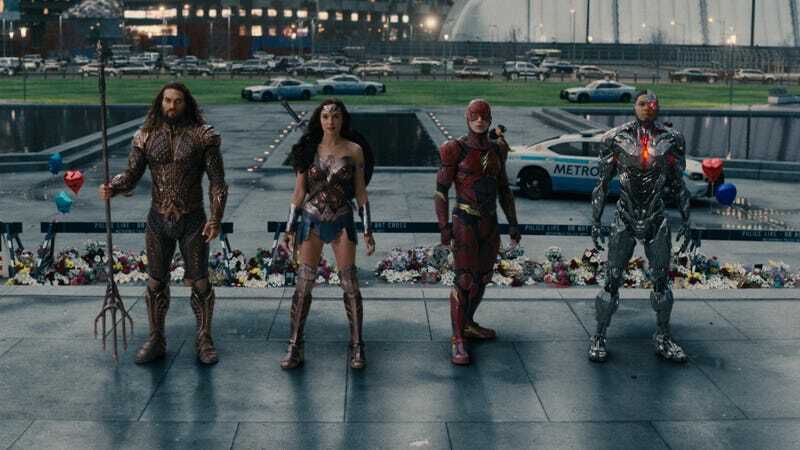 Justice League’s opening weekend wasn’t a disaster, exactly, and the all-heroes-on-deck jamboree could still conceivably turn things around, holding on tight over the holiday, the way Fantastic Beasts And Where To Find Them did last Thanksgiving. And, as we noted yesterday, Wonder Woman opened only a little stronger, before continuing to dominate over the weeks that followed. Of course, that movie was widely, enthusiastically admired by critics and audiences alike. Justice League…isn’t. Speaking of relativity: If $96 million doesn’t quite cut it in the high-stakes world of seasonal event movies, a fourth of that tally can be cause for jubilation when you’re talking about a film as modest—in cost, scope, and ambition—as Wonder. The feel-good family drama, about an adorable 10-year-old boy with facial anomalies, parlayed strong word of mouth and robust group sales to a surprising $27-million debut, landing in second place above holdovers Thor: Ragnarok, Daddy’s Home 2, and Murder On The Orient Express, as well as the lightly attended faith-based cartoon The Star, which made just $10 million on almost 3,000 screens. Meanwhile, last week’s limited-release winners, Lady Bird and Three Billboards Outside Ebbing, Missouri, continued to climb the box-office charts as they expanded into more theaters, rising to $4.7 million and $1.5 million, respectively. For movies of their size, clearing a million is its own astronomical achievement.